SHANGHAI — The final World Golf Championship of the year is a case study in how quickly the landscape can change. Jon Rahm had never played in one of these elite events and it wasn't his highest priority a year ago because he had played only one PGA Tour event as a full member. Now he's at the HSBC Champions as No. 5 in the world, making him the highest ranked European. Hideki Matsuyama was coming off a victory in the Japan Open and a runner-up finish in Malaysia, worthy of celebration because the Japanese star had moved into the top 10 in the world for the first time in his career. 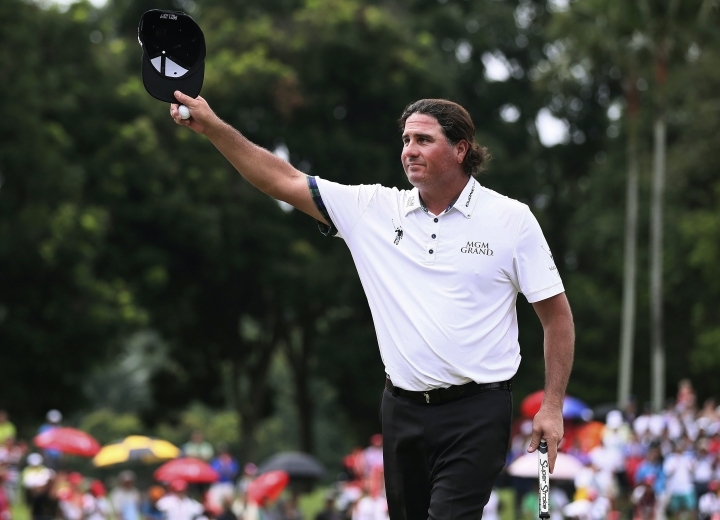 He won by seven shots at the HSBC Champions, part of an amazing stretch in which he won five times in nine starts. Patrick Cantlay had gone two years without even playing because of a back surgery he feared might end his career. He made it back to golf in February, to the Tour Championship in September and to his first World Golf Championship this week at Sheshan International. Not even he can believe he's No. 18 in the world. Perez was No. 333 at this time a year ago after returning to golf following surgery on his shoulder. The last time he even qualified for a World Golf Championship was at the HSBC Champions in 2009, the week he said he realized he was "globally unknown." "I pulled up the schedule and saw my name on it twice as the defending champion," said Perez, who went from one to three career victories by winning the CIMB Classic in Malaysia and the OHL Classic in Mexico. "That was so cool," he said. "I can't even believe it's going on. I'm living it, but it hasn't sunk in. I don't see myself with Brooks Koepka, Rory McIlroy, Dustin Johnson. Those are super athletes. I'm not even in consideration with them. But it's nice to be where they are. It's nice to be on the big schedule. No. 18 in the world. Who in the hell would have thought that?" Getting into the top class of golf is hard enough. Staying there isn't that easy. Just ask Jason Day, Adam Scott and Patrick Reed, all of whom were in the top 10 in January and failed to win this year. Bubba Watson isn't at the HSBC Champions because at No. 60, he isn't eligible. Johnson, Matsuyama and Rahm lead the field when the HSBC Champions begins Thursday in some of the best weather this tournament has ever seen. It's the end of a three-week Asian swing for Perez and about a dozen other PGA Tour players. It's the stretch drive for a group of Europeans that include Tommy Fleetwood, who is leading the Race to Dubai, and Rahm, who still harbors hopes of catching him. It won't be long before a new year begins, and based on the way this year has gone, the possibilities are endless. "I think I've said many times what I think of my year. You know, unbelievable," Rahm said. "Not many players get to say this, but I accomplished a lot more than I set my mind to at the beginning of the year. It's very special. I accomplished a lot of goals that weren't in my mind at the beginning of the year, such as top 10 in the world, winning on the European Tour. There are many things that I set my mind to that I ended up doing." Johnson had an idea where he was going at this time a year ago, just not the detour in his path to the top. He won his first major at the U.S. Open. He won twice more over the next few months and was one round away from winning the FedEx Cup. He was No. 3 in the world, though his game was pointed in a strong direction and he fulfilled that through the spring with three straight victories against the strongest fields to reach No. 1. And then he slipped down the stairs on the eve of the Masters, wrenched his back and didn't win again until August. Matsuyama cooled off in the spring when he went three months without a top 10, but then he was runner-up in the U.S. Open, won another World Golf Championship and contended at the PGA Championship. His game has looked tired since then. Getting his game in top form was one thing. Keeping it there was even tougher. "I'm still learning how to do that," Matsuyama said. "That's one of my goals, one of things I'm working on now, is to be able to stay on top of my game."